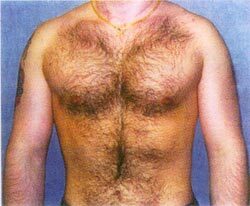 Augmentation of the male chest is usually performed via a 5- to 6-cm transverse axillary incision, and subpectoral space is filled with a preformed silicone implant. Pectoralis implant models are available for the normal to wide chest, and the long, slim thorax. When all, or a portion of the pectoralis is absent an implant fashioned from moulage will likely provide the greatest symmetry. 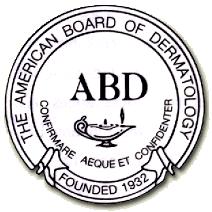 Similar to submuscular augmentation of the female breast, dissociative anesthesia aided by local anesthesia (bupivicaine) may be used for chest enlargements. However, greater muscle relaxation can be obtained with general (paralytic) anesthesia. The pectoral fascia at the muscle border is separated longitudinally. Then, all muscle attachments to the ribs must be lifted to the sternum and the pectoralis serratus border elevated. If a pectoralis implant suitable for a long, slim thorax is used, a partial “S” cut may facilitate insertion. A three-layered closure, pectoralis fascia, subcutaneous tissue, and subcuticular polypropylene suture is carried out. Post surgical wraps or a vest garment can be used for 7 to 10 days. Exercise can resume in 3 weeks and weight lifting in 6 weeks. In contrast to what is desirable in Latin America, the quest for buttock enlargement in the United States is small, but growing. Early attempts to satisfy these requests with deep subcutaneous implants usually met with encapsulation and unnatural configuration. 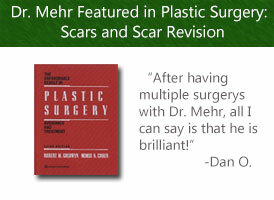 Fat autografts, when properly dispersed, provide a degree of improvement. This is especially true when combined with hip and trochanteric liposuction. Decreasing the prominence of these surrounding areas increases the visual perception of buttock projection. In 1984, Jose Robles, MD, of Argentina introduced the concept of submuscular gluteoplasty. A round silicone implant was placed between the gluteus major and gluteus medius muscles. This could produce a 2 ½ to 3cm increase in buttock projection. In the last 9 years, I have performed subgluteal augmentations and have developed a more anatomical implant, which improves the outcome, but proper orientation requires more care. The basic object is to raise the maximum point of projection. Ancillary procedures may be needed for the markedly ptotic buttock. This operation is not undertaken lightly. The patient is advised that there is often significant postoperative pain (controlled by Percocet) while the heavy gluteus major adjusts to the stretch of the implant. There may also be sciatic radiation pain, especially if any serum or blood collects, increasing the pressure. This generally resolves in 2 to 3 weeks. If there is any excess iliac and/or trochanteric fat, the patient is always offered liposuction reduction with fat injection to the buttock as a first option. If both surrounding fullness and gluteal flattening are present, implant augmentation may be done at the same time as liposuction and fat injection. However, for those who are lean and flat, there is no alternative to submuscular gluteoplasty to provide a natural projection and contour. The operation is performed though a 7-cm incision in the natural crease, starting at the tip of the coccyx and proceeding superiorly. At the level of the sacral fascia, the fibro-fatty layer is cleared over the gluteus major for 6 cm on each side. The gluteus is incised and spread bluntly in line with its fibers to a depth of about 3 cm between the muscles – where the plane is not always well defined. A pocket is made ending at the pyriformis to avoid the sciatic nerve. General anesthesia combined with muscle relaxants, are helpful, and with strong retraction, the implant is positioned. Good muscle closure followed by a midline repair catching sacral fascia is essential. As in all implant procedures, infection is the most feared complication. I have had only one, and explantation was required. Drains are not used; a binder or postsurgical wrap is optional. Most patients are more comfortable in the prone position postoperatively. Recovery time varies, and walking comfortably may be possible as early as 4 days or as late as 2 weeks. Sitting forward, on the ischium, is allowed at any time. Postoperative hygiene is stressed. Full activity and exercise is expected at 4 to 6 weeks, but fluid collection of blood and serum, indicated by lowgrade fever and sciatic irritation, may delay this. An under developed lower leg can be a source of embarrassment. 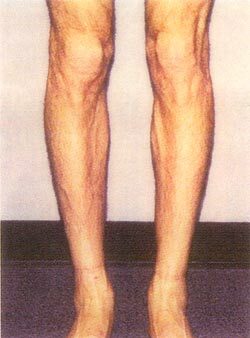 This is even more true when it is associated with asymmetry, congenital deformity (tibial torsion, pes planus, genu valgus), trauma, or disease. In some people, calf development fails to respond even to strict exercise regimens. Augmentation of the calves with subfascial silicone implants ahs been practiced for more than 25 years and is a reliable procedure, particularly with the Aiache lenticular implant. Technique and accurate selection of size bear heavily on the outcome. The implants are placed through a transverse popliteal incision in a plane dissected between the gastroc fascia and muscle. A larger size is usually used over the medial head. The septum, between the gastroc heads and its neurovascular bundle, is preserved. The implant must be seated at the bottom of the facial sock, which envelops the gastrocnomus, but care is taken not to destroy the toe of the sock if the implant slips too low. A special paddle or spade dissector aids in this maneuver. Small branches of the sural nerve, especially in the medial dissection, may be sacrificed. This can result in temporary patches of numbness. The incision is repaired with 3-O polyglycolic acid suture for fascia and 4-O polypropylene suture for subcuticular tissue. Gauze, 4x4s, and paper tape dressing over surgical adhesive is provided, along with a post surgical wrap. A moderately elevated heel provides comfort. With significant tibia torsion it may be advisable to augment only the medial head to provide balance. 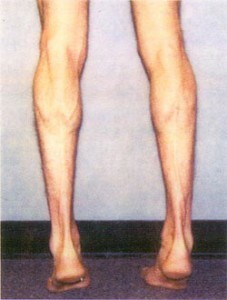 When the lower portions of the legs are thin, augmentation of the calves alone may exaggerate the deformity. I have used several techniques to fashion more pleasing contours. 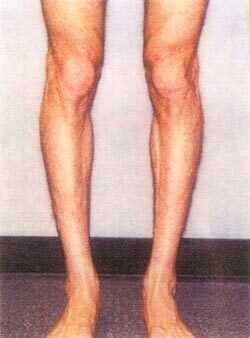 Liposuction of the knees and, at times, the lateral distal leg may be combined with fat autografting to the lower medial knee and medial ankle. 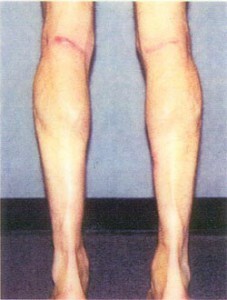 Subcutaneous augmentation of these areas, as well as the medial tibial areas has been successful. I have developed a combined medial, calf-medial, leg sub-fascial silicone implant, which has met with patient approval and no complications. The medial implant has a rod-like fascial investment to augment the leg just above the malleolus. Ambulation is immediate to return home, but bed rest with leg elevation for 2 to 3 days is necessary to avoid seroma. Rapid return to weight training or vigorous exercise before 4 weeks may result in hematoma or seroma, which may require needle drainage. Sudden expansion may result in tissue breakdown. Dissociative or local anesthesia is adequate for all calf and leg procedures. 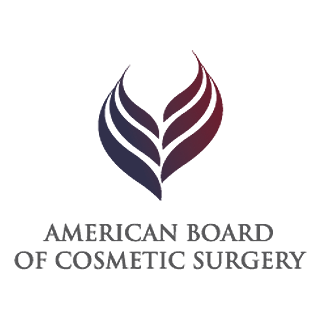 In addition to the preformed pectoral, buttock and calf implants, custom body implants- made from moulage to correct pectus excavation, trochanteric and other contour deformities – are used. The area to be augmented is outlined with a gentian violet pen and petroleum jelly is applied. A powder and water mix or premixed paste is applied and worked until the desired contour is obtained. Having photos in the standing position is helpful. When the moulage is firm, it is gently lifted off, placed on a soft base to dry and packed in a box with soft supports and padding. Then it is sent to a facility, where a mold is formed and a complete implant produced. Having one or two small holes are helpful for orientation and fixation. 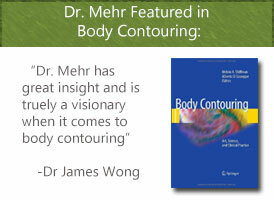 Body Implants, when combined with liposuction and body lifting techniques, demonstrates that the era of true body sculpting has arrived.